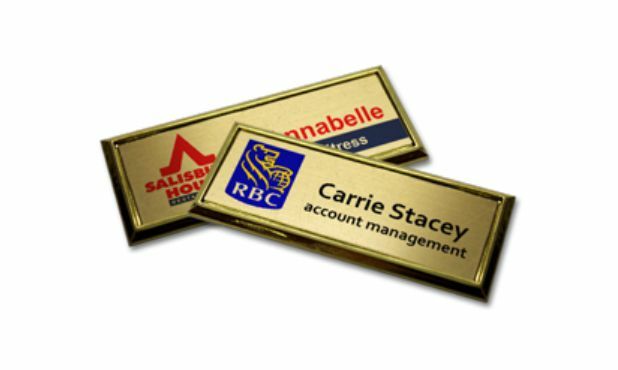 This plastic gold name tag holder has a shiny, reflective finish and is designed to stylishly hold a 3" x 1" brushed gold aluminum name tag. 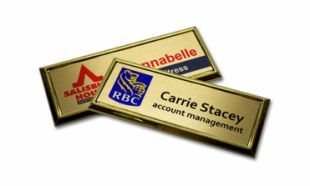 A full or one colour Polyetch inscription completes this name tag. The holder comes shaped with beveled edges and square corners. Comes with an extra strong pin backing that locks positively and holds securely. Enquire about our rush services. No production set-up charges. Artwork set-up cost may apply for custom artwork and logos.